Insulation Tester – 5000V – Selectable voltage. Measures: Resistance, Continuity, Dielectric absorption ratio, Polarization Index, Dielectric Discharge and Capacitance. Rechargeable batteries, 128kB Memory, PC interface, Programmable. The AEMC 5070 is a versatile, high quality Insulation tester suitable for applications such as insulation testing cables, motors and transformers. The 5070 Insulation tester differs from the 5060 and 5050 in it’s user display and programmable functions. Due the amount of features included with this instrument please see the datasheet and user manual for a complete list. Example of the graph display function. The graphic and digital display gives the user the ability to display the test data graphical in many different ways. The 5070 can also display test information on an analogue bar and of course in digital format. The instrument can display test voltage, test current, resistance, elapsed time and capacitance all in real-time (This should in no way be interpreted as a complete list). The 5070 is exceedingly customizable with programmable temperature compensation, test voltage lockout and alarm settings to name a few. The configuration of the more advanced features of the 5070 is very easy to use. The 5070 comes with the DataView software. The user can also setup programmable test runs for hands free operation. Adjustable test voltage from 40V to 5100V (also programmable). Test voltage adjustable in 10V increments (from 40V to 100V). 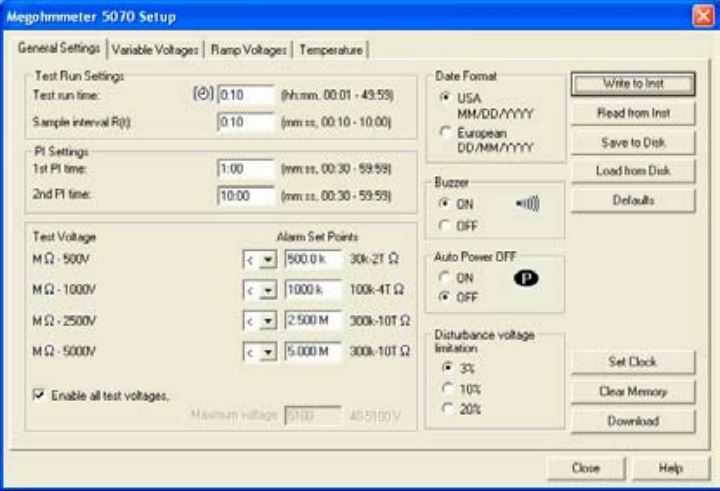 Test voltage adjustable in 100V increments (from 1000V to 5100V). Designed and built to IEC safety standards. Multiple safety features including voltage waring indicator and test inhibition. Tough dual wall weatherproof field case. Test inhibition selectable at 3%, 10% or 20% of test voltage. Can print reports directly to serial printer. Stores over 1500 test results. For a full list of features and functions please see the datasheet and user manual.